Guitarist Milan Polak is best known for his live and session work in the European theater. However, Americans may remember him as the guitarist for Falco of Rock Me Amadeus fame in the mid 90's. But we won't hold that against him. Polak has jammed with Jeff Waters (Annihilator), Dimebag Darrell (Pantera), Billy Sheehan (Mr. Big), and Tangerine Dream among many others. He is self taught, but has actively pursued formal education on the jazz side of guitar in both the US and Europe. On his own he has delivered two instrumental albums and one vocal album for Lion Music. Murphy's Law is the second of the latter for Mr. Polak on Lion. This work finds Polak's sound a bit more aggressive, yet still driven by his exceptional guitar playing over a melodic rock foundation. Murphy's Law promotes Polak's guitar over melodic hard rock with some novel compositions. There are touches of progressive rock on pieces like Inner Truth, The Mystery Of Life, and Sheeple. Several songs weave strong groove laden undercurrents that range from rock (Wannabes) to funk (Sheeple) to fusion (The Opposite of Love). For pure melodic hard rock with a heavier, sometimes modern, feel Murphy's Law and Fake are two of the best. In the midst of all this, you will even find the basic hard rock power ballad: Torn, a real delight and possibly the best cut on Murphy's Law. Additionally, the work is marked by strong vocal arrangements and intelligent lyrics; the latter being something hard to come by in any genre. Overall, the guiding principle of catchy and innovative melodic rock reigns supreme. Milan Polak's fourth release and second vocal album, Murphy's Law, is straight melodic hard rock made more interesting by clever innovation from rock, prog, jazz fusion, and Polak's own novel guitar work. There's nothing conventional about Murphy's Law, and we're better for it. Recommended! 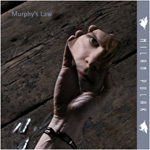 Milan Polak's fourth release and second vocal album, Murphy's Law, is straight melodic hard rock made more interesting by clever innovation from rock, prog, jazz fusion, and Polak's own novel guitar work. There's nothing conventional about Murphy's Law, and we're better for it.